Christian Themed Bookmark. Great value gifts with an inspirational message. There are variety of bright designs and religious messages. 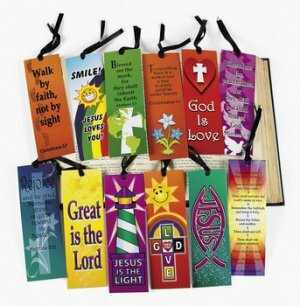 Bookmarks measure 5cm by 15cm and are made of strong card with a black ribbon. Good value and very popular in our prize bag. Loads of great Church gifts and great prices. These bookmarks have been a big hit with our young people.